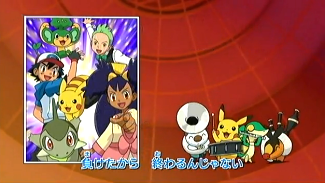 "Fanfare of the Heart" (心のファンファーレ) is the first ending theme to Pocket Monsters Best Wishes. CD('s) found on: TV Animation Pocket Monsters Best Wishes "Best Wishes!" and "Fanfare of the Heart"
The goal of the following translation is to present the meaning of the song in a competent, coherent way. It is not meant to be an English version of the song that can be sung along with the melody. That being by yourself is better than being with everyone? Somewhere, they're surely thinking of you. Even though you still have far to go. Just one more centimeter before you can reach the sky. It's OK to be nervous. Let's go on the path we believe in! Dogasu's Backpack is a fan-created website Pocket Monsters (Pokémon) is © 1995-2011 Nintendo / Creatures Inc. / GAME FREAK, Inc. / Pokémon USA / 4Kids Entertainment Inc. No infringement of copyrights is meant by the creation of the web site.